Interact with this square pyramid for a minute or two. You can alter the base and height of this square pyramid by dragging the 2 white points. How would you describe the relationship between a square pyramid's LATERAL HEIGHT and its TRUE HEIGHT? To explore this resource in Augmented Reality, see the directions below the applet. Suppose each edge of the square base measures 10 cm. If this square pyramid's lateral height measures 13 cm, what would its true height be? What would the pyramid's lateral area be? What would its total surface area be? What would its volume be? 1) Open GeoGebra 3D app on your device. 2) Press the 3 horizontal bars (upper left corner). Select OPEN. 3) In the SEARCH TAB that appears, type V9cAn76T Note this string of characters can be found in the URL here. Be sure to either copy & paste this code or type it just the way you see it here. 4) The slider named n does the entire animation. Slide this completely to the right. 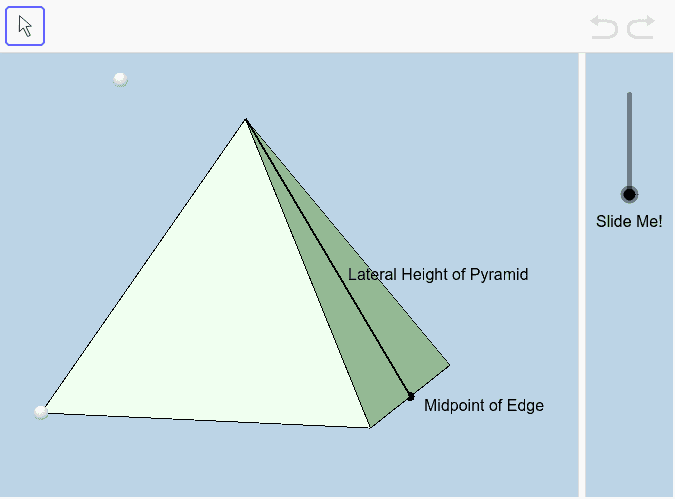 When in 3D view, you can move the white point (outside the pyramid) up or down to change its height. You can also drag the large white points on the pyramid's base to adjust the base size.